99.9% Reviewers Recommends This Product. We provide the best product. Our customer is the King. All orders will be processed and shipped in 2-5 business days. 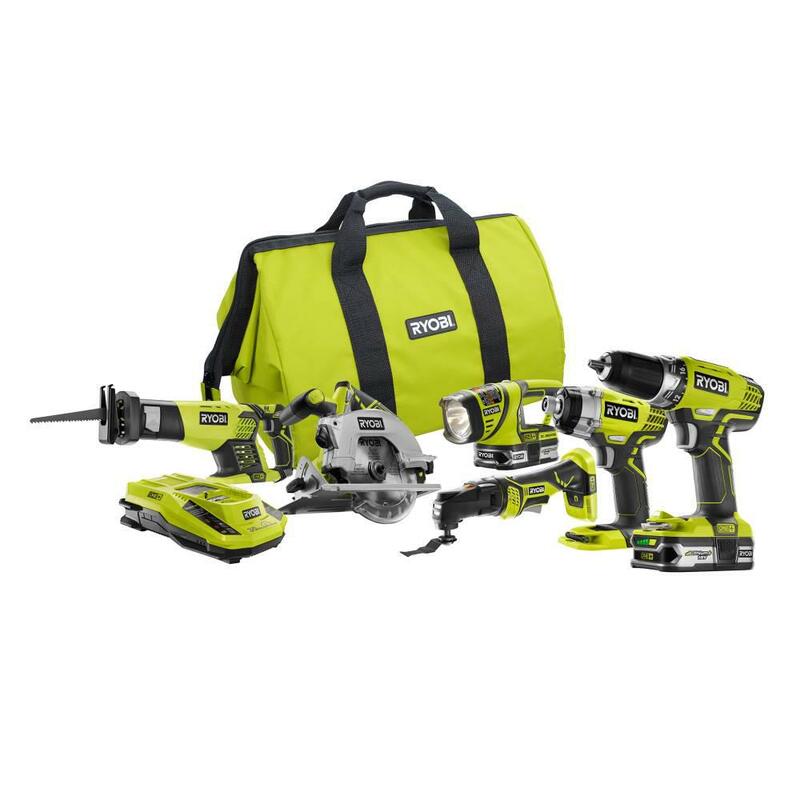 RYOBI introduces the 18-Volt ONE+ Lithium Ion Cordless 6-Tool Combo Kit with (2) 1.5 Ah Batteries, Dual Chemistry Charger, and Tool Bag. The variable-speed reciprocating saw includes a blade with a 7/8 in. stroke length capable of 3,100 SPM. For high-torque fastening jobs, turn to the impact driver for spinning lag bolts and deck screws. A carbide blade comes with the 5-1/2 in. circular saw, capable of carving through material at speeds up to 4700 RPM (no load). A keyless chuck secures 1/2 in. bits into the drill, a variable-speed device that allows you to select one of 24 clutch settings for optimal torque. Cut, scrape and sand hard-to-reach spaces with the JobPlus base and multi-tool adapter (some JobBase accessories sold separately). With the included ONE+ worklight, you'll never lose sight of your projects. This worklight can be positioned on its belly, rear or hung from above with the ability to rotate and point the head where desired. Backed by the RYOBI 3-Year Manufacturer's Warranty, this 6-Tool Combo Kit includes a Drill/Driver with Screwdriver Bit, a Circular Saw with Blade and Blade Wrench, a Reciprocating Saw with two Blades and a Hex Key, an Impact Driver with Phillips Bit and Socket Adaptor, a JobPlus Base with Multi-Tool Attachment Head, Wood Cutting Blade, Segment Saw Blade, Sanding Pad, Sample Sandpaper, an Allen Wrench, a Universal Multi-Tool Accessory Adaptor, a Worklight, a Charger, two 1.5 Ah LITHIUM+ Batteries, a Tool Bag, and operator's manuals. Tool weights: drill, 2.7 lbs. ; circular saw, 4.7 lbs. ; impact driver, 2.65 lbs. ; reciprocating saw, 4.1 lbs. ; job plus base, 2.15 lbs. ; work light, 0.7 lb. We accept payment only through PAYPAL. We ship the product after recieved clear payment and give full information about shipment to the buyer. We accept product return within 30 days from delivery date but product should be in original position and not in damaged condition,the return shipping charges will be buyer responsibility. Our customer is the King and your satisfaction is very important to us.